Subject: Plate : This plate shows Charlemagne receiving the submission of Widukind at Paderborn in Germany, after Ary Scheffer. Size (in cm): The overall size is ca. 27 x 16.5 cm. The image size is ca. 16.5 x 12.5 cm. Size (in inch): The overall size is ca. 10.6 x 6.5 inch. The image size is ca. 6.5 x 4.9 inch. 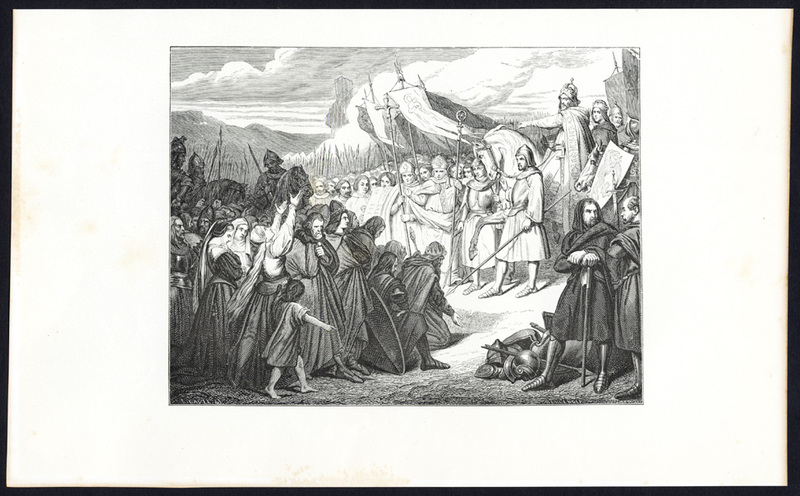 Description: This attractive original old antique print / plate originates from: 'Charlemagne' by Alphonse Vetault, published by Alfred Mame et Fils in Tours, France 1877. Artists and Engravers: Alphonse Vetault (1843 - 1898), French historian.